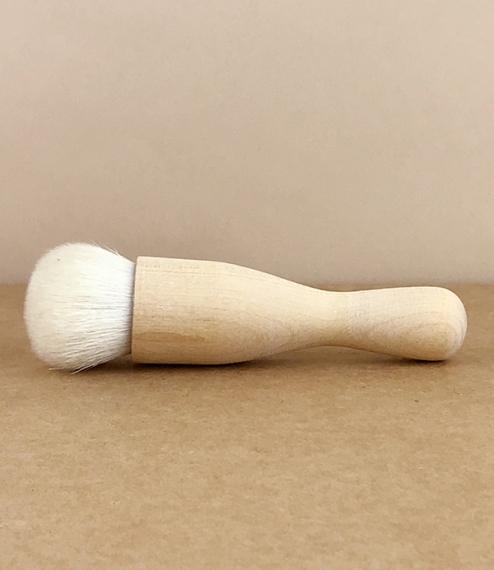 A pale birch wood and exceptionally soft white goat hair dry powder brush ideal for blusher, contouring, powdered foundations, and finishing powders. The Swedish tradition of visually impaired craftsmen finding work in the manufacture of brushes continues today in the form of Iris Hantverk, which employs over 30 such individuals producing some of the world’s most beautiful and high quality brushes. Best kept dry and dusted off against the fingers. Just under 13cm total length with bristles of about 3cm.